Josh talks on the resignation of Tim Farron and how such a move can affect Christians and how they are viewed by a wider audience. So, as you probably read by the title, I’m probably going to sound rather opinionated rather quickly, however, you did stumble into a political opinion sphere, so, jokes on you. There you go, disclaimer over, on with the article I guess. Recently Tim Farron, leader of the Liberal Democrats here in the UK, stepped down and said he could no longer live as both a political leader and a committed Christian as he felt a lot of his policies could not reflect his faith in the way he saw it. Now, before I sound too totalitarian I have to add a disclaimer (yes, another one) that I understand that faith and religious standings are subjective, that’s why denominations like the Catholics, Baptists, etc exist. I also understand that standing by your convictions, like David Cameron at the end of the Brexit vote, means leaving when times are right for you to do so. However, in the case of Tim Farron I feel the man has set a tone that does not strike well, at least with me. He seems to state that to be a Christian, and a liberal leader, that does not condemn or does not feel the call to condemn those who are gay, had abortions, are not middle class, might have used drugs, might be promiscuous, or whatever Christians are meant to hate in this world, is a magical entity that cannot exist (and because it’s magic and we’re mental judge-y Christians we should kill it if it does because it has to have something to do with the occult). Besides the joke and ridiculous exaggeration there, I am feeling a tonal shift recently that as a politically liberal (basically socialist nutcase) and committed Christian, puts me in a state of unease. You see, with the rise of President Trump – a phrase that doesn’t get easier to write or say – the Brexit vote, and then vote to secure Theresa May and the DUP in charge of the country that I find so hard to be proud of at times, the rise of fundamentalism is no longer coming. It’s here, and here’s why. We have “Christians” proclaiming that refugees should be put to death, or grow the stones to fight in their own countries. We have “Christians” denying basic healthcare to women, or just the poor in general. We have “Christians” performing acts of terror that, because they’re white – and some times dressed as the dumbest ghost I have ever seen, are not being classed as terrorist acts. We have “Christians” denying global warming. We have “Christians” denying LGBTQ+ persons rights. Now I know what you’re thinking, but Josh, that’s all well and good, but where does Tim Farron fit into all of this? Well, if you were to tell a child “you can never be a female chief executive, or a male professional dancer, it’s impossible” all that will do cripple that dream in the majority of cases, in other words you have squashed a dream relevant to that child’s direction given by God/the universe/whatever you believe. So, why has Farron said this to a generation of people looking to make a change, it’s created a sub-conscious ‘Us vs Them’, ‘Christians vs Liberals’, which is the last thing we need right about now. Now if we were to look at Farron’s policies and where he stands on gay rights for example (because out of that and the abortion stance that’s the only one mentioned in the Bible) now, in this case it shows up in a couple of places, however the main one everyone thinks of is in the same place as stoning to death someone who has a divorce and re-marries, now if you’re Jewish and in the 1271 – 1592 BC era then this rule is all a-okay to live by. However, we’re not, as a Christian – emphasis on Christ – it means you follow the things Jesus said. This means that the ruling of Matthew 7:12 trumps any of the old testament, this is because you can’t respect anyone like yourself if you’re stoning them to death. So, are we to judge people on those same fundamentalist Jewish elements Tim? Are we to stone someone to death because they wore mixed fabrics? I need to know because I have Lycra-denim jeans and I want to know if I have to stay away from quarries. The point is, I would say to anyone looking for an answer from this article; Christians, don’t let the world tell you “you cannot be open and liberal as well as a committed Christian” because 1 Peter 2:17 says that you are in the right, that you are continuing the work Jesus asks of you, just be true to yourself about it and do not let officials and MP’s stop you doing this. It’s what you’re called to do. 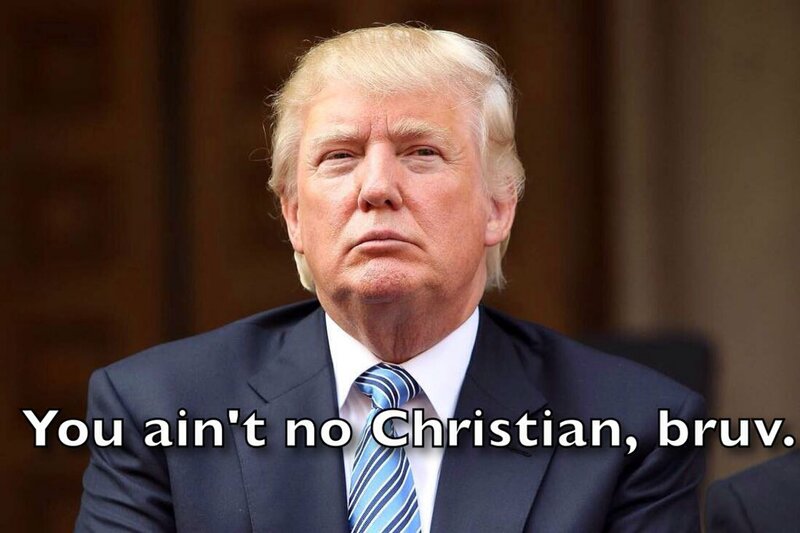 Non-Christians, if there is a “Christian” who tell you you have no place in what God built or this world, for your lefty beliefs, your sexuality, your gender identity, your race, your religion, sexual history, your needs/wants of an abortion, they are not an example of the rest of us. Please, understand, they are basically the YouTube commenters of the church. If you have any issues with anything written here or anywhere else by people claiming God called them to write it I will more than happily have a discussion with you, with all the respect and reverence your points deserve. Also if you want to discuss how a Christian who wear’s tight pants, loud shirts, drinks wine, and is one of the most metrosexual men he knows, isn’t informed enough, please let me know, I would love to chat to you. Next Next post: Really? Are We Really Having To Do This? Welcome to the Northern Jester. Where news from the North East is reported and satirised from a left-wing perspective. Created as a project to write a news piece and an opinion piece/satire/cartoon a day. Really? Are We Really Having To Do This? The Northern Jester Powered by WordPress.com.